Lorimer No 2 is a sans family designed for display settings. Narrow letters, tight spacing, and a low x-height make Lorimer № 2 better suited to display settings than fonts adjusted to work in text settings. Packaging, identities, and headlines are ideal applications for Lorimer No 2. 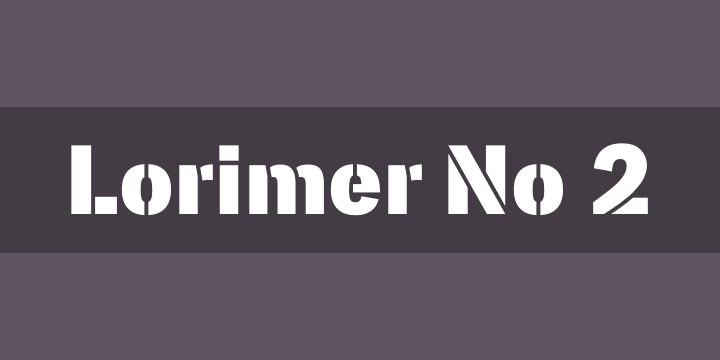 Designer James Puckett developed Lorimer No. 2 as the result of researching nineteenth century memorial inscriptions. A condensed sans serif inscription on a Manhattan burial vault prompted research and experimentation. Research turned up similar letters in American wood type, memorials in an Indian cathedral, and enameled tiles in the New York City subway. Puckett developed his experiments into a type family with two widths, five weights, and matching italics.